“O me, O life of the questions of these recurring. Of the endless trains of the faithless. Of cities filled with the foolish. What good amid these, O me, O life? More serious than some of Apple’s other recent TV spots, the ad is inspiring and effective, accompanied by an equally fascinating Your Verse website on Apple.com that includes many stories of using an iPad for a variety of professional and creative pursuits. The commercial first ran during the NFL 49ers vs Panthers playoff game, and will likely be aired widely from here on. I like this one a lot, beautiful ad and the emphasis on creativity is great. Personally, I can’t do anything creative on an iPad aside from a simple finger sketch or two, but it’s cool that others use it for more than browsing the web and reading articles. 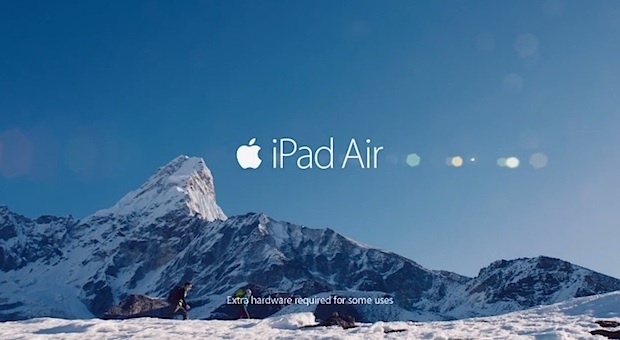 The worst thing about this commercial is that fancy underwater iPad case the divers are using isn’t for sale, because it would be an awesome product for us PADI nerds (yes, I checked on Apple’s site)! This seems to be waterproof. There is a part which demonstrates the new iPad under the water. waiting for the new iPad Air. Very powerful and moving words..I am not very tech literate but the words and images in this commercial has just stunned me.